What sets our company apart. Weldon Home Exteriors works closely with the James Hardie Corporation and is a Preferred Remodeler. We install our siding according to James Hardie standards and specifications, thereby offering a full warranty. James Hardie Corporation actually scores all of our work and we have earned the highest score in Georgia for siding installation from the James Hardie Corporation and Guild Quality Survey. Customer satisfaction is our highest priority and has enabled us to earn the business of as many as 46 homeowners in a single subdivision. We are proud to say that no other company in Georgia can say the same. Owner Lee Weldon maintains constant communication and visits job site daily. No money is required up front. Estimates are free and can be scheduled to meet the needs of our customers including nights and weekends. Full warranty is offered on all materials and labor. We are fully Licensed and Insured. Detailed customer referrals are available and on site viewing of our work with Mr. Weldon is available upon request. Weldon Home Exteriors is family owned. My wife Carrie and I along with our boys Clay and Tyler have lived in the Buford /Sugar Hill area for almost 20 years. We are highly involved in the community we live in. Our boys attend Lanier High School and are members of the high school baseball team, cross country team and band. Our family enjoys mountain biking, hiking, hunting and fishing. 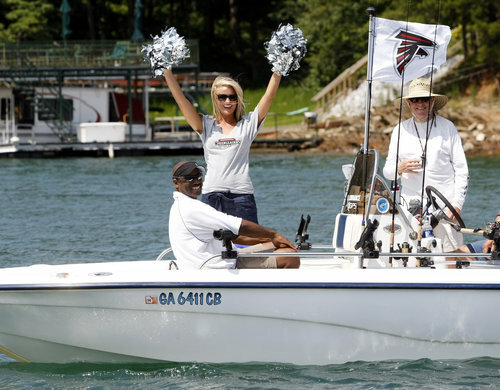 We volunteer every year with the Atlanta Falcons and Wounded Warriors Foundation to take a wounded vet out for a day of fishing. We are also involved with the Get Kids Fishing Organization. They provide a day of fishing for underprivileged children and children with chronic medical conditions. We hope that by our family and business having a firm foundation within the community gives our customers a sense of trust and peace of mind. The custom look you want. Let our experts help you refresh the look of your home while using durable state-of-the-art materials to protect your valueable investment from the damaging effects of sun, rain and moisure. Just call us at 770-932-6568 and we can discuss your dreams for your home.